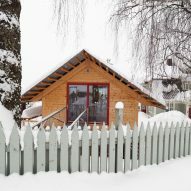 Jon Danielsen Aarhus has designed a gabled shed to accommodate the hobbies of a recently retired couple in Lillehammer, Norway. 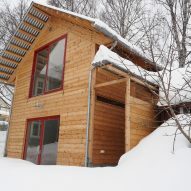 The Oslo-based architect created spaces for the clients to paint, sculpt, practice botany, store their cross-country skis, and have family and friends over to stay. Barn House replaces an existing run-down outbuilding in the grounds of the couple's 100-year-old listed house, but keeps the position and proportions of the old building. 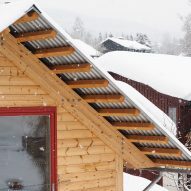 Aarhus used traditional Norwegian barn building techniques for the two-storey gabled structure, adding the more modern addition of bolted joints to the wooden post-and-beam construction method. 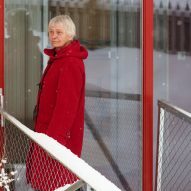 The bridge that leads to the first floor entrance is an other element borrowed from Norway's agricultural architecture. "The aesthetic of this building is the result of activities, first and foremost," said Aarhus. 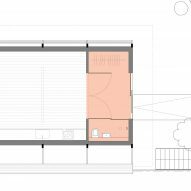 "It is also an attempt to use a traditional way of building, in order for the architecture to sit well in an old and sensitive built environment." 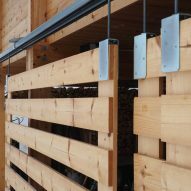 The gabled form of Barn House is made up from five glue-laminated timber frames. Inside, the wooden walls connecting them have been left exposed to match the furniture. The couple made most of the shelves, counters and workbenches from scaffolding wood leftover from the build. 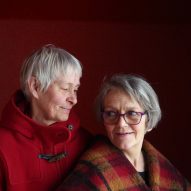 "Kristin and Ruth have been together for 41 years. Both active career-women throughout their adult lives. Today they're entering retirement together. But they have no intention of making it an inactive one," explained Aarhus. "They want to spend their retirement doing what they love. Ruth paints and sculpts, and tends to her plants," he continued. "Kristin is a technician at heart, and fixes what needs mending. She enjoys staying physically active, and during winter she goes cross-country skiing in the forests and mountains surrounding Lillehammer." 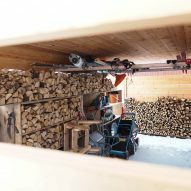 At ground level there is a garage with room to park two cars and to store chopped wood, skis, bicycles and other equipment away from the elements. Kristin's workshop is located to one side, and Ruth also uses the space to store and tend to her plants during the winter months. On the first floor, a long room under the gables runs most of the length of the annex. 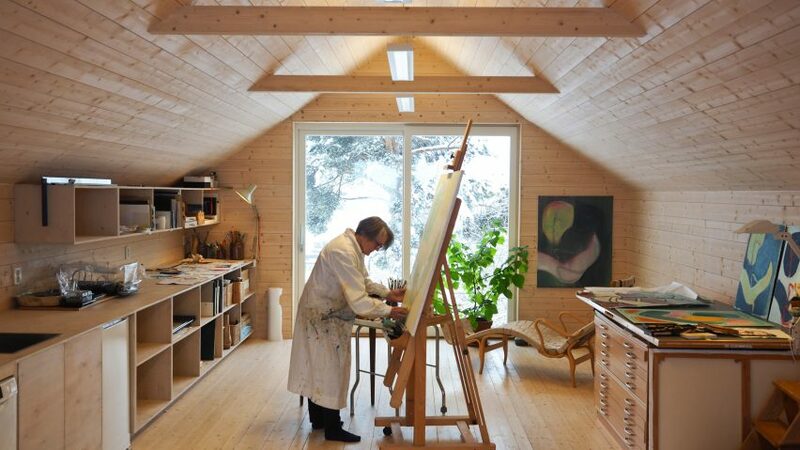 With large double windows at one end filling the room with natural light it makes an ideal art studio for Ruth. 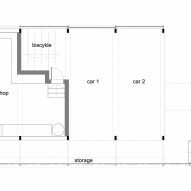 Cupboards with countertops inset with a sink and hob provide catering facilities for the annex, and together with a separate bathroom mean the space can be transformed into a separate guest house when family come to visit. Red window frames and an all-red entrance hall provide a vivid burst of colour against the raw timber. 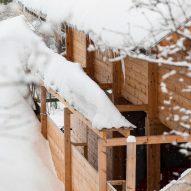 Aarhus also built a pine-clad cabin in the mountains between Oslo and Bergen for his own family, complete with a glazed living room wall facing out over a lake.